Born in Maiduguri, Nigeria, she was raised in the suburbs of London and Nashville, Tennessee. Her poems have received three Pushcart Prize nominations and have appeared or are forthcoming in American Poetry Review, New England Review, Black Warrior Review, The Iowa Review, Hayden’s Ferry Review, Callaloo, and several anthologies. A writer and editor from Morocco, her work has or will appear in Muzzle, PANK, Salt Hill, Rookie, and other publications. She is the founder and EIC of Winter Tangerine, a magazine dedicated to evocative writing and art. She currently lives and studies in New York. Originally from Ethiopia, Lena grew up in the north of Sweden. She has a master´s in Library and Information Science and a B.A in Literature and Creative Writing from the University of Montana. A British-born Ghanaian poet and writer, she is currently an assistant facilitator for the Barbican Junior Poets programme, and was also shortlisted for the Brunel University African Poetry Prize 2016. She is one of ten poets on the acclaimed UK mentorship programme, The Complete Works. A South African writer who holds a diploma in Public Relations and a degree in Business Administration, she’s currently studying for BA degree in Languages and Literature and writes for AfroElle Magazine. An Ewe writer from Ghana, her work is born from her compulsion to dissect silence, and triumph; to tell full, true, human stories exploring the liminal spaces in which we exist, and lay bare the beauty of our sites of contradiction. Her work has appeared in The Black Arts Quarterly, As-Us Journal and The Sonder Review. Momtaza Mehri, sugah. lump. prayer. A biomedical scientist, poet, and writer, she is of East African (Somali/Jeberti) and Yemeni descent. Her work is featured or forthcoming in OOMK, Hard Food, Puerto Del Sol, Elsewhere, Bone Banquet, among others, and was anthologized in Podium Poets as part of the London Laureates longlist. 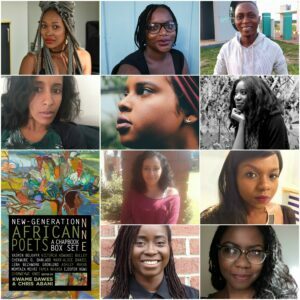 She serves as editor of the digital space Diaspora Drama and was shortlisted for the 2016 Brunel African Poetry Prize. Chekwube is a Nigerian American writer of poetry and fiction. She was born in Lagos, Nigeria and raised in Washington, D.C. and West Baltimore. She is working toward an MFA in fiction at the University of Illinois in Urbana-Champaign. Ejiọfọr is from the Umuekọị family in Alọr-Agụ. He lives and writes in Nsukka, Nigeria. His poetry and short fiction have been published in Guernica; African American Review; Drumtide Magazine; The New Black Magazine; Sentinel Nigeria; ELSEWHERE LIT’s anthology of contemporary African poetry; Cordite Poetry Review‘s anthology of new African poetry; The Kalahari Review and The Muse. A poet of southern African descent living and writing on Treaty One territory in Winnipeg, Manitoba, her work has been long-listed for the Cosmonaut’s Avenue Poetry Prize, shortlisted for the Brunel University African Poetry Prize and appears or is forthcoming in several publications, including CV2, Room, Prairie Fire and Lemon Hound. She is pursuing a Master of Arts in linguistics at York University.